CTET July 2109 Eligibility, Exam Pattern, Application Fee for Central TET Paper I, Paper II: Central Board of Secondary Education, CBSE has released the notification and detailed information bulletin for Central Teacher Eligibility Test, CTET 2019. The online application process for CTET 2019 July examination would commence on ctet.nic.in. The registration process would be active from February 5, 2019 till March 5, 2019. 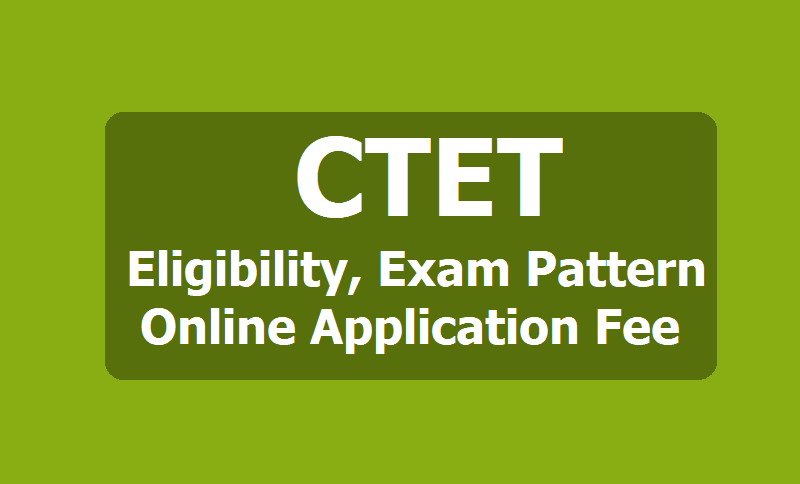 Check CTET eligibility, CTET important dates and how to apply for CBSE CTET 2019. The online application forms have been released and are now available. Basic eligibility, important dates and steps on how to apply along with direct links are provided below. All the candidates are advised to go through the detailed notification before filling the online application form and check their eligibility before they apply. The application process for Central Teachers Eligibility Test (CTET) July session exam has already begun from February 5, 2019. Candidates can register online at ctet.nic.in before March 5, 2019. The last date for payment of registration fee is March 8, 2019.The exam will be held on July 7, 2019. # Correction in application: Candidates can make any corrections in their application particulars between March 14 and 20, 2019. After this date, no correction or modification shall be accepted after March 20. # Status of Application: Candidates can check the final status of application and/or particulars of candidates from March 25. # CTET 2019 Results: The exam results for CTET July 2019 will be declared six weeks after the examination is conducted on July 7, 2019. The CTET paper 1 exam will commence at 9:30 am and concludes 12 noon. CTET is conducted for qualifying candidates for teaching positions. For classes I to V, candidates are required to qualify CTET Paper I and for Classes VI - VIII, candidates need to qualify Paper II. For CTET 2019 Paper I, candidates should have passed Class 12 (or its equivalent) with at least 50% marks and passed or appearing in final year of 2- year Diploma in Elementary Education or 4-year Bachelor of Elementary Education (B.El.Ed) or 2-year Diploma in Education (Special Education) or Graduation with at least 50% marks and Bachelor of Education (B.Ed). For CTET 2019 Paper II, candidates must have graduation degree and passed or appearing in final year of 2-year Diploma in Elementary Education or in 1-year Bachelor in Education (B.Ed) or in 1-year Bachelor in Education (B.Ed), in accordance with the NCTE or 1-year B.Ed. (Special Education). Candidates who have passed Class 12 with at least 50% marks and passed or appearing in final year of 4- year Bachelor in Elementary Education (B.EI.Ed) or 4- year B.A/B.Sc.Ed or B.A.Ed/B.Sc.Ed can also apply. Date for release of admit card would be released and informed on the official website ctet.nic.in. Candidates are advised to keep a check on the official website in regards important annoucements that may be made from time to time. Updates would also be provided on this page. Only Paper I OR II Both Paper I & II.. Step 1: To apply, candidates are required to go to ctet.nic.in. Step 2: On the home page, click on the activated link to Fill Online Application Form for CTET 2019. Alternativelu, click on the link provided here. Step 3: On the new window that opens, for new users, click on Apply. For registered candidates, candidates can simply sign in. Once you register, you would be sent an OTP on the email id provided. Step 4: Complete the registration and fill the details in the online application form. Step 5: Uploard the scanned documents and pay the fees. FEE: Fees for only Paper I or Paper II is Rs. 700 for General candidates and Rs. 350 for reserved categories. As for candidates who wish to appear for both Paper I and Paper II, the fees if Rs. 1200 for general category and Rs. 600 for reserved catgeory. Step 6: Once the fees is paid, print the confirmation page that would be generated. Candidates are not required to send the confirmation page. Please keep the same for correspondence purposes. The online application is complete only once the confirmation page is generated. The application process for Central Teachers Eligibility Test (CTET) July session exam has begun from February 5, 2019. The exam will be held on July 7, 2019. The last date of application is March 5, 2019. CTET has released the official information brochure for the July session 2019 examination. Log on to CTET official website www.ctet.nic.in. Go to the link that reads “Apply Online”. Fill in the Online Application Form and note down Registration No./Application No. Upload Scanned Images of your latest Photograph and your Signature. Pay Examination Fee by e-challan or debit/credit card. Print Confirmation page for record and future reference. Log on to CTET official website www.ctet.nic.in. Click on the "Apply Online" link. Step three: Fill in the Online Application Form and note down Registration No./Application No. Upload Scanned Images of latest Photograph and Signature. Pay Examination Fee by e-challan or debit/credit card. Print Confirmation page for record and future reference. In case confirmation page is not generated, candidates should approach the Joint Secretary (CTET), CTET Unit, CBSE between 10:00 am to 5:00 pm from March 14 to March 20, 2019. Candidates would need to provide proof of application fee payment either through e-challan or through Credit/ Debit card.